Manufacturer of a wide range of products which include Adadis Gel and Alotol Soap. 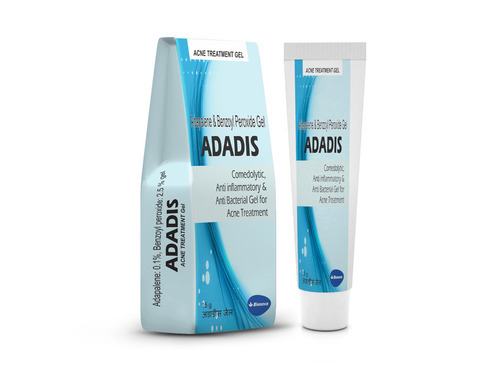 ADADIS gel is indicated for the topical (on the skin) treatment to treat acne vulgaris in patient 9 years of age and older. This medication is a combination of adapalene (a retinoid) and benzoyl peroxide (an and skin-peeling agent). This product may decrease the number and severity of acne pimples and promote quick healing of pimples that do appear. Adapalene works by affecting the growth of cells and decreasing swelling and inflammation. Benzoyl peroxide works by reducing the amount of acne-causing bacteria and by causing the skin to dry and peel off. This medication is used on the skin to treat acne. This medication is a combination ofadapalene (a retinoid) and benzoyl peroxide (an and skin-peeling agent). This product may decrease the number and severity of acne pimples and promote quick healing of pimples that do appear. Use for the treatment and prevention of acne pimples, blemishes, blackheads and whiteheads. ADADIS gel is for topical use only and not for oral, ophthalmic (pertaining to the eye) or intravaginal use. Wash your hands before applying this medication. Gently clean the affected skin and pat dry. Apply a thin layer of this medication usually once daily or as directed by your doctor. Use your fingertips to apply a small amount of medication (about the size of a pea) to the affected area of the face (e.g., forehead, chin, each cheek). Avoid the eyes, lips and mucous membranes. Do not rinse after applying. Let the gel work deep inside the skin. Apply ADADIS gel to areas where pimples and excess oil occurs. Once your skin has cleared, continue using ADADIS gel to keep new pimples from forming. Glycerin rectal is used as a laxative. It works by causing the intestines to hold more water, which softens the stool. glycerin rectal is used to treat occasional constipation or to cleanse the bowel before a rectal exam or other intestinal procedure. glycerin rectal may also be used for purposes not listed in this medication guide. vitamin E is an antioxidant that occurs naturally in foods such as nuts, seeds, and leafy green vegetables. vitamin E is important for many processes in the body.